I engaged in my first ever Readathon the other day. I had seen a sign at the library recently and had been intrigued — intrigued enough to sign up for the event, and so that is where I spent most of Saturday afternoon – at what our library very sweetly called a “reading party”. I don’t know why, but I really enjoyed this community of silent reading. In the past, I had always been puzzled by those who do 24-hour readathons in the blogging world, but now I understand that idea and although it would be unlikely for me to be able block off 24 solid hours, I do know that I could block off a significant part of the day to dedicate to reading. 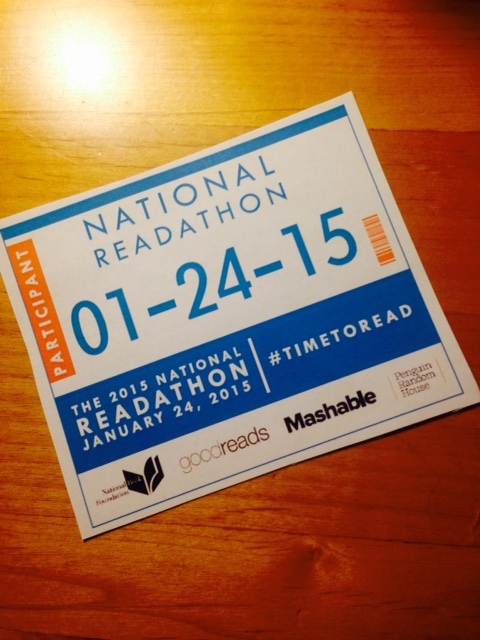 I just need to schedule a day and time, and bingo — off to my own personal Readathon. It’s a fabulous idea, and if you ever get the chance to participate in a community-based one, jump at the opportunity. It’s a very perfect reading set-up (or at least mine was!). So – who wants to come to a reading party? This entry was posted in Uncategorized and tagged Books in general, Library, readathon by lizipaulk. Bookmark the permalink.